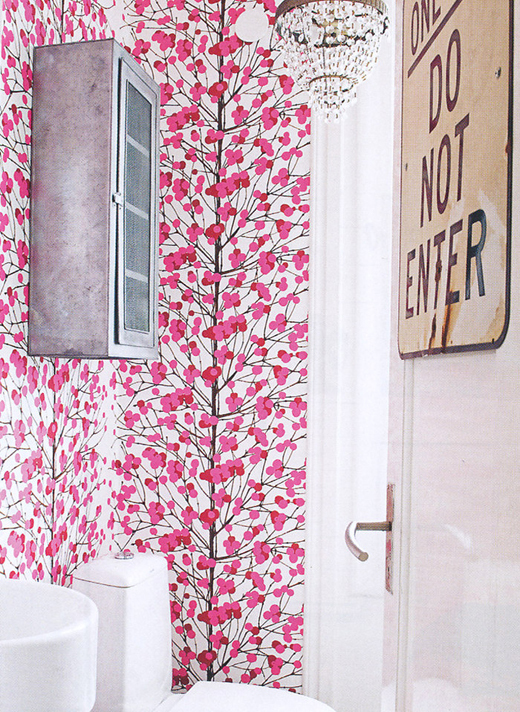 These bathrooms feel like sweet candies, don't they? And, most amazing is that they do so without adopting the classical cutie, romantic, often overwhelming style. Like the bare concrete floor and the sleek built in cabinets in the first photo (with the pink shades flirting spontaneously here and there) and the bold patterned wall just below (still, wallpapers in the bathrooms..) with the industrial tin cupboard and the DO NOT ENTER sign. 1.Barbara Groen, 2.Jean-Marc Wullschleger via Dustjacket Attic. 6 comments on "Bathroom sweeties"
Lovely! The first is my favorite—so delightfully cheerful and fresh... Wishing you a beautiful weekend! Εμένα πάντως δεν θα με χάλαγε καθόλου να έχω ένα τετοιο μπάνιο.